Sheet metal fabricators are nowadays being called upon to work with a high level of design flexibility at short notice, as opposed to the more repetitious style of work that dominated past eras. These demands can often be on very niche assignments, as is demonstrated by the fitout work performed by Pacific Bodyworks of Sydney, which has leaned towards Adira press brake technology to optimise bending and shaping of product. Pacific Bodyworks is contracted to manufacture service bodies and truck bodies for fleet vehicles of Telstra, Sydney Water, Integral Energy and Pirtek which have large fleets and require fitout with high storage capacity for spare parts and technical equipment. According to Managing Director of Pacific Bodyworks, Steve Mills, investing in Adira’s press brakes through Australian distributor Power Machinery Australia allowed full automation and processing of blank sheets, plus high latitude for seamlessly increasing production quantities whenever required. “The machine operators on the shop floor report that these units are very simple to use, with user-friendly software,” said Steve Mills. “Durability and long-term suitability are also a positive aspect of Adira’s press brakes technology”. Pacific Bodyworks processes more than 100 tonnes of aluminium sheeting annually. “Adira’s press brakes are suitable for our type of work, with length of the brake ideal for our applications”, said Steve Mills. Adira’s synchronised press brakes combines accuracy and speed of execution when pressing materials of heavy weight and large length to fine and demanding tolerances. This synchronised press brake technology facilitates accurate bends of consistent quality with reduced operational and set-up times for a variety of uses, various tools and bending different materials. A computerised graphic numerical display provides exact control over the finest of tolerances. Numerical controls are by Cybelec of Switzerland. All ModEva controls run on the Windows operating system allowing full network integration and internet connection. If the backgauge has more than four axes, or the bends are particularly complex, a numerical control with a graphic display such as the ModEva 12 or 15S with flat screen and touch pad is recommended. For oversized projects, Adira’s press brakes can be used in tandem. This takes the maximum available machine length of 10 metres and effectively caters for projects up to 20 metres in length. Each machine can simultaneously use different tools, provided the work height is the same for both machines. 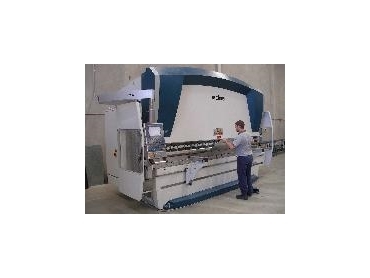 Adira’s press brakes can also be customised to the specific requirements of the user complete with and tool sets. Some examples of the various options include: standard and ‘L’ versions that incorporate longer stroke, wider opening between tools, and a bigger gap to enable the bending of very large or awkward parts. Up to nine back gauge axes are available on three independent towers with all axes driven by brushless servo-monitors allowing high displacement speeds with high positioning accuracy. Tooling options are many and varied, with a wide range of high quality ground tools and different types of clamping. Upon request, Adira can design and develop special tools to make the most complex of bends possible. To minimise OH&S risks, access to potentially dangerous areas of the Adira has effectively been inhibited, while tooling change procedures are safe and swift. This attention to safety is complimented with ergonomic control stations to increase operator comfort and productivity. Before delivery, machines are fully assembled and tested to ensure maximum quality and operation of all machinery, accessories, controls and tooling.